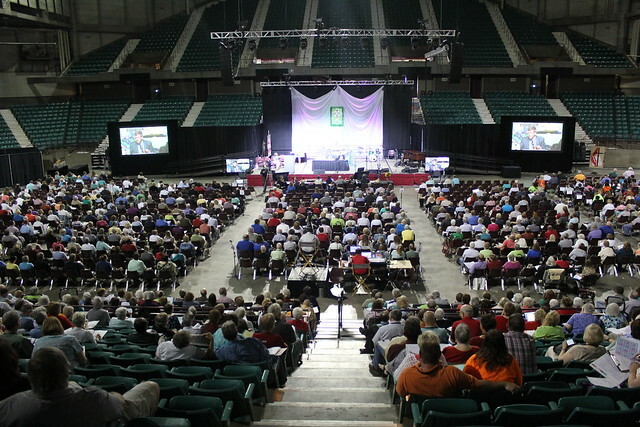 The 2016 Great Plains Annual Conference Session was heldr June 1-4, at the Kansas Expocentre in Topeka, Kansas. The theme, "Serving Christ Near and Far," focused on the global connection of the United Methodist Church. Videos from the plenary sessions and worship services are available for watching and for downloads. Personnel Committee Report and Resolution on "Equal Pay for Equal Work"
Check out the nearly 700 photos from the 2016 Great Plains Annual Conference session in our Flickr gallery. Retired Archbishop Elias Chacour was ordained a priest in the Melkite Catholic Church in 1965, and sent to the village of Ibillin in Galilee, not far from the village of Nazareth. In the early 1980s, he opened Mar Elias, a school where all local children could receive an education, regardless of religious affiliation. Approximately 4000 students now commute from seventy different villages to attend high school and university. Father Chacour was Archbishop of Akko, Haifa, Nazareth and all of Galilee from 2006 to 2014. He is the author of two books about the experience of Palestinian people living in present-day Israel, "Blood Brothers" and "We Belong to the Land." George Howard, deputy general secretary for Mission and Evangelism for the General Board of Global Ministries, was one of the creators of the partnership between the North Katanga Conference and the West Ohio Conference, and a founding leader of The United Methodist Church for All People, a multiracial, cross-class church in Columbus, Ohio. The Mission and Evangelism Unit of GBGM recruits, places and supports missionaries, including young adults, from many lands and cultures in a variety of ministries. The unit also promotes and oversees new mission initiatives; cultivates ties with conferences and mission partners outside the United States; and links to the mission volunteer movement. Download the PowerPoint presentation provided by Howard during his teaching time. You have two opportunities to beautify your home, church or workplace while helping with two of our fund-raising efforts in the Great Plains Conference. One opportunity involves buying a print of a Nativity scene prepared by artist Kansas artist Meredith Radke-Gannon (pictured at right). The artwork was presented to Bishop Scott Jones and his wife, Mary Lou Reece, as part of the celebration of the bishop’s ministry in the Great Plains during the recently completed annual conference session. If you would like to purchase a print, fill out this form. Each 5-by-7 print costs $25. Each 8-by-10 print costs $35. Proceeds will go to help the renew Camp Comeca campaign. Also during the annual conference session, the Oklahoma Indian Missionary Conference (OIMC) presented the bishop with artwork depicting the first American Indian pastor evangelizing to other natives (shown below) by artist John Walkabout, a Cherokee from Oklahoma. To purchase a print, contact Courtney Fowler, conference lay leader, at courtney.fowler@greatplainsumc.org. The cost for each print is $125. Proceeds will go to the OIMC pastoral salaries endowment. Our theme this year was "Serving Christ Near and Far." Check out our video that spotlights some of our ministries in our own back yards in Kansas and Nebraska, as close as our jurisdictional partners in Texas and Oklahoma, and as far away as the African continent. Also, we provide a little taste of spirituality with our #WeAreMore campaign.